Product prices and availability are accurate as of 2019-04-19 05:57:58 UTC and are subject to change. Any price and availability information displayed on http://www.amazon.com/ at the time of purchase will apply to the purchase of this product. Author Bookstand is proud to offer Lipstick and Double-Cross at the Balinese by Bookstand Publishing. Bookstand Publishing offers books by the best indie authors throughout North America and the world. Bookstand Publishing is dedicated to offering original content to a broad audience and promoting great authors, literacy, and freedom of expression. 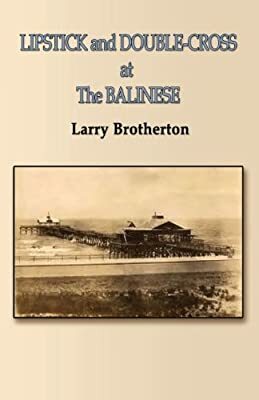 Lipstick and Double-Cross at the Balinese has generated a lot of interest and excitement and we think it would be an excellent addition to your library. Located in Galveston, extending more than 600 feet into the Gulf of Mexico, the Balinese Room played host to the likes of Frank Sinatra, Phil Harris, Alice Faye, the Marx Brothers, and the largest illegal gambling operation on the Gulf Coast. 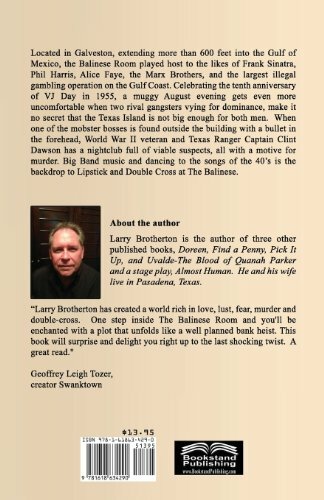 Celebrating the tenth anniversary of VJ Day in 1955, a muggy August evening gets even more uncomfortable when two rival gangsters vying for dominance, make it no secret that the Texas Island is not big enough for both men. When one of the mobster bosses is found outside the building with a bullet in the forehead, World War II veteran and Texas Ranger Captain Clint Dawson has a nightclub full of viable suspects, all with a motive for murder. Big Band music and dancing to the songs of the 40's is the backdrop to Lipstick and Double Cross at The Balinese.